Observed in the ponderosa forest in the Granite Mountain Wilderness, Yavapai Co., Arizona, USA. September 2012. By late summer the flowers become attractive to a variety of insect pollinators such as the beetle shown below. 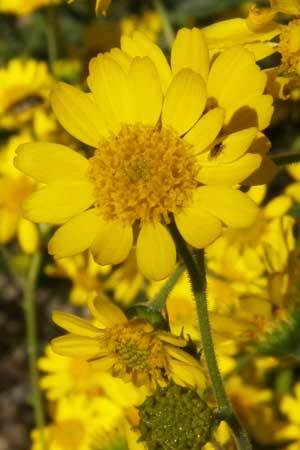 FLOWERS: Numerous yellow disc and ray florets in a composite head. Ray tips are rounded with a few shallow teeth. Disc florets each develope into a single-seeded fruit termed an achene or cypsela. The heads are up to 2 cm or more in diameter. 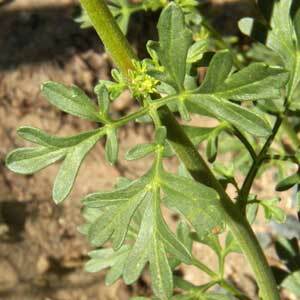 LEAVES: Pinnately divided into many segments. ANNUAL: Regrows from seed each year, germinating in late spring and flowering by late summer into fall. 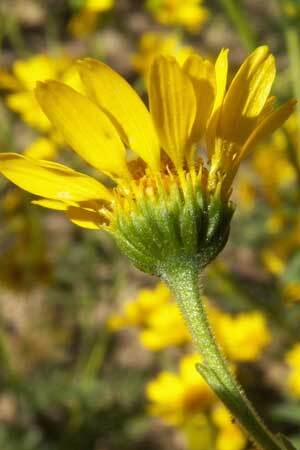 RANGE: Found in montane meadows and forest throughout much of southwestern United States. FRUIT: The seeds are narrowly conical with no obvious crown.